Graham Ross’s exploration of the church year with the choir of Clare College moves now into slightly more niche territory, with a feast that is only rarely celebrated in Protestant Britain, for all its importance elsewhere. The feast of Corpus Christi celebrates the joy of the Eucharist (in contrast to the solemnity of Maundy Thursday), and the unifying thread of this disc comes from the poetry of St Thomas Aquinas, whose Eucharistic poems have given the text for several great musical settings, most notably the Pange lingua itself, but also others like the famous Panis angelicus. It’s a typically intelligent example of programming and repertoire choice from Ross, and I think the disc works very well, offering a window into a Christian celebration of which, I confess, I knew little before. One thing that makes this disc rather special is the recorded acoustic which, more than most of the others in Ross’s series, makes a tangible contribution to the disc’s success. The tracks with organ were recorded in Norwich, but all the a capella tracks were set down in the incomparable acoustic of the Lady Chapel at Ely, which is uniquely generous to the human voice, and the palpable bloom around the sound really brings their polyphony to life. You get that bloom right from the plainsong of the first track, and it means that the musical lines of Josquin’s mass really flow in the most magnificent way. Renaissance polyphony, sung like this by young singers of great energy, is a tonic. The basses sound rich without being heavy, the tenors are bright and flexible, the altos are vigorous and the sopranos crest above the whole with angelic purity and gleaming brightness. You might argue that their youthfulness and inexperience means that the depths of their insights are fairly shallow, but then you listen to the spiritual insight of their singing of Et incarnatus est and criticism disappears. 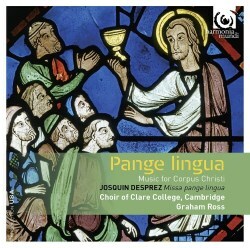 The interweaving of the solo voices in the Agnus Dei is particularly special, and Josquin’s mass makes a worthy cornerstone for this selection. The other major work on the disc is Finzi’s Lo, the full, final Sacrifice, which is based on an English reinterpretation of Aquinas’ text. The Clare singers give a performance of remarkable maturity and insight, here, and Ross guides us through Crashaw’s dense text and Finzi’s profound music with a great sense of unfolding pace and narrative power, shaping the whole span like a great arch that culminates on the section that sees God sitting on the throne of heaven, and subsides into a ravishing final Amen. The other pieces are also very well chosen. Victoria’s Lauda Sion rings with bell-like clarity and a rhythmic flexibility which, in the sixteenth century, could almost have passed for syncopation. Pierre de La Rue, a Flemish contemporary of Josquin, writes a beautiful Salutaris hostia that has the same simplicity and directness that would, much later, be tapped into by the likes of Bob Chilcott and John Rutter. Byrd’s Cibavit eos commemorates the miracle of the corn and honey from the rock in an appropriately celebratory style. Much more luxurious harmonies (and excellent intonation) are on offer in Bairstow’s Let all mortal flesh. It is fascinating, intelligent and very instructive to hear Villette’s setting of O sacrum convivium alongside that of Messiaen, his compatriot whom he greatly admired. Francis Grier’s Panis Angelicus is hauntingly beautiful, and Graham Ross’s own setting of the Ave verum corpus is mostly homophonic but attractively mysterious, mirroring the mystery of the miracle they are celebrating. This is another success, then. There can’t be many seasons of the church year left for the group to celebrate, so we should revel in these discs while they still come.